Liriope is commonly known as monkey grass or spider grass. It is a versatile and easy to grow ground cover that tolerates heat well and can be divided easily. 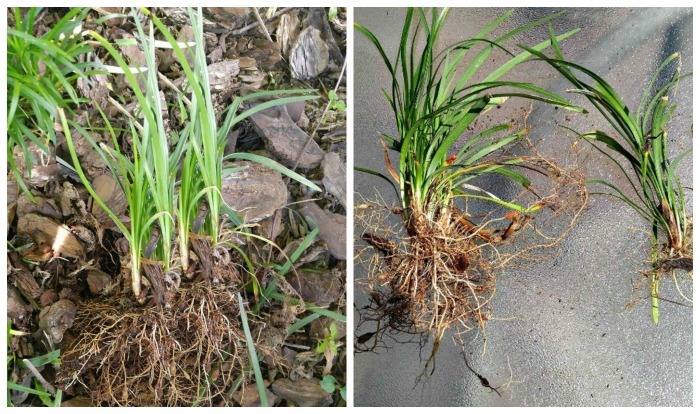 Transplanting monkey grass is a simple process if you keep just a few things in mind. As far as growing perennials is concerned, it is one of my favorite easy care plants. 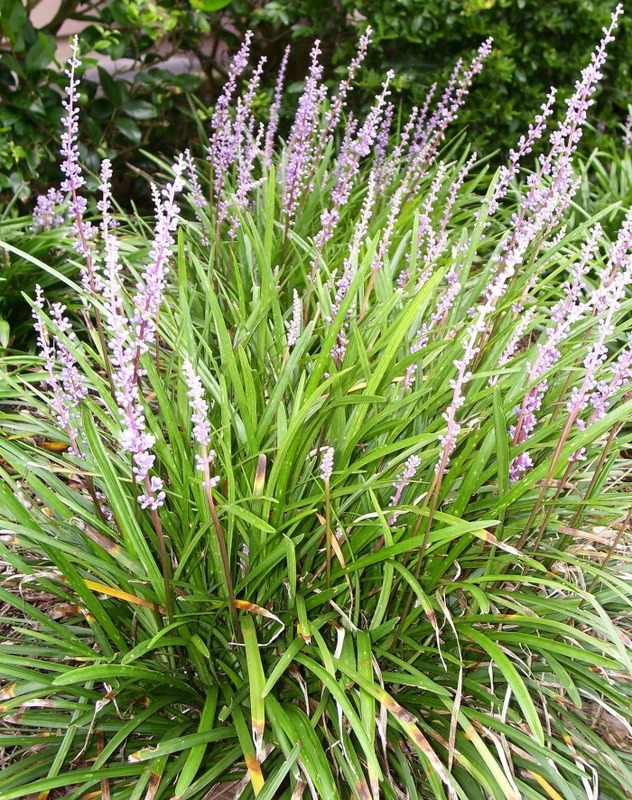 If you have monkey grass (liriope) in your garden now, you have the opportunity to have more of this perennial plant for free. It multiplies readily, and runners can be dug up, and placed in another area of the garden in no time at all. The plant sends out underground runners which form into smaller new plants easily. 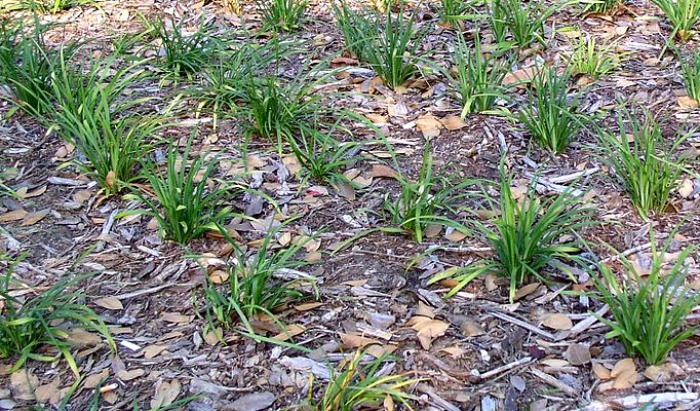 The best time for transplanting monkey grass is the same as for most perennials – when the plant is dormant. Typically this would be in the beginning of the spring before new growth starts. It is easily moved, though, and can be transplanted right through mid summer. It does need to establish rooting well before cold weather so it should not be moved too late in the fall. The plant will fill in quickly so be sure to plant the babies about a foot apart or so. This will give it room to grow without being over crowded. This border was planted last year at this spacing and is filled in well. The most common type of liriope has plain green leaves – liriope sipcata, but there are also variegated – liriope muscari variegata, and pure white varieties – Liriope muscari ‘Monroe’s White’.
. The green plant is easier to grow and multiplies faster than the variegated versions. All types do multiply and can be planted as divisions in other garden areas. These two plants are the same age but the plain green one on the left is much larger and has babies growing already. Monkey grass likes well draining soil, so it’s a good idea to dig around the area when you want to place it to loosen the nearby soil. Adding organic material such as compost or manure will also be beneficial to the plant. Liriope is grown more for the leaves than the flowers but it does flower in summer. If you transplant then, cut off the flowers to encourage the plant to use its energy for developing the root system. Flowers look almost like small grape hyacinths. Liriope multiplies like mad so if you have one plant, you will likely have plenty in no time at all. Because of this, don’t take a clump that is too large. 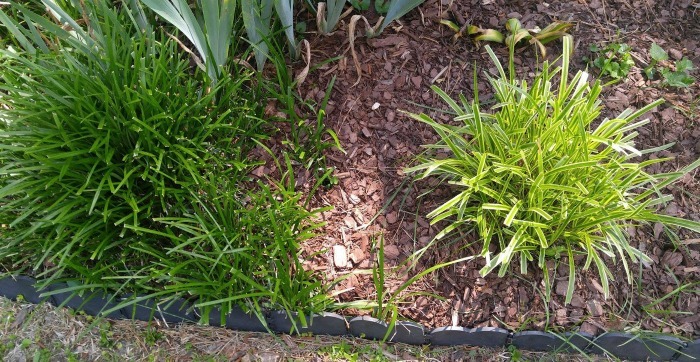 Liriope can be invasive, so starting with a smaller sized piece of it will mean that it can be more easily maintained. If you have a large clump, gently pull apart the roots to give you several plants. Be sure each piece has a crown section and plenty of roots. Don’t you just love plants for free? I cut back all my monkey grass early in the spring and this goes for transplants, too. I generally do this just before the new growth starts. The plant can get a bit ragged looking in the winter months and cutting back old growth gives it a haircut and encourages lush new growth. 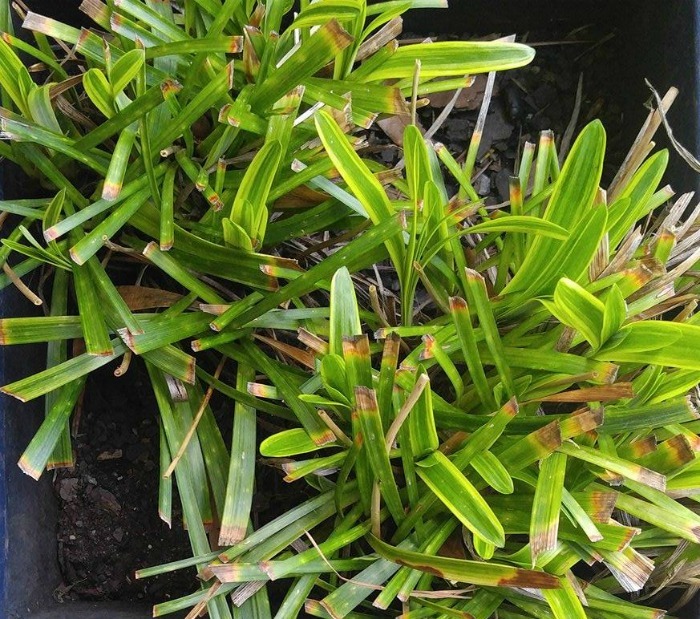 If you are looking for an easy care evergreen perennial plant that will give you more plants for years to come, you can’t go wrong by transplanting Monkey Grass! 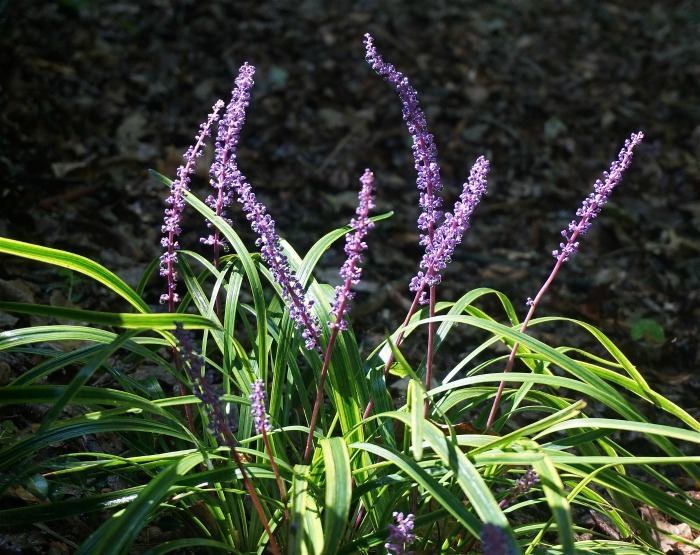 Some varieties of monkey grass, particularly liriope spicata are quite invasive and can take over a yard. If you have more of it that you would like in your garden, see my tips for controlling monkey grass. Thanks for the extensive explanation on how to deal with monkey grass. I do have one question if you care to answer. When my wife thins out our monkey grass, she gives me the extras and I then trim the tops down to about 4 or 5 inches and plant it. I trim it thinking it has a better chance to start. She is a pretty fair gardener and claims that is a big mistake, that I should not trim it. If you care to answer, I appreciate your time. 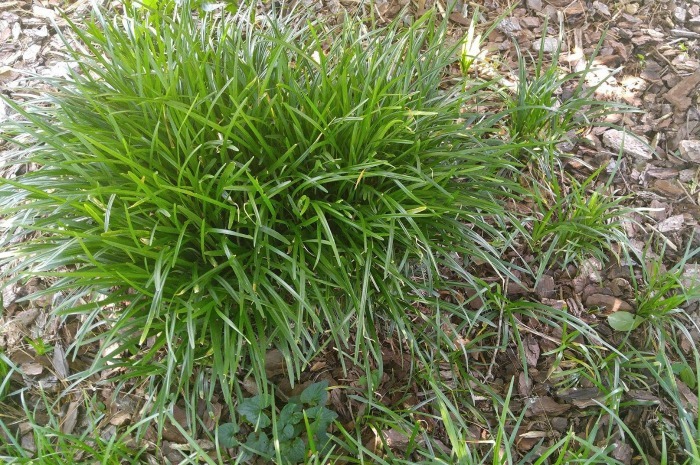 To be honest, Monkey grass is so hardy that there isn’t much that will hurt it. Generally I do trim plants somewhat when I try to transplant, but perhaps not give it such a “hair cut” as you suggest. 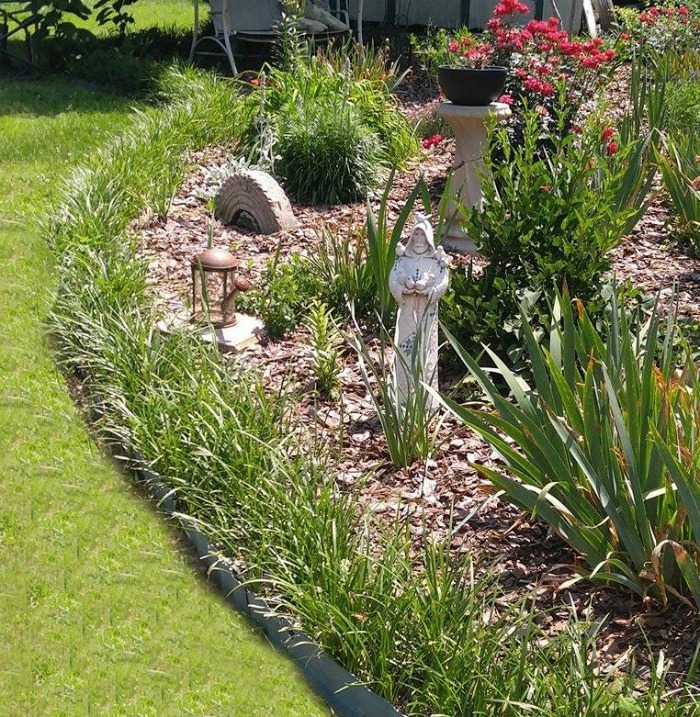 I do trim monkey grass plants right down the to crown in early spring though. This gets rid of the dead foliage and gets it going again vigorously. I think I have Monkey grass I heard the name years ago from my friend who did landscaping & I saw the grass.What do I do to keep & grow what I have.? Hi Mary. IF it’s monkey grass you won’t need to do much to keep it alive. It is a very forgiving plant. These tips show how to grow it.